Online product activation. Product activation is a technology is used by a number of licensing schemes available today. Manco .NET Licensing System allows you using product activation to bind license to a single computer so that the same license can’t be used on another PC. 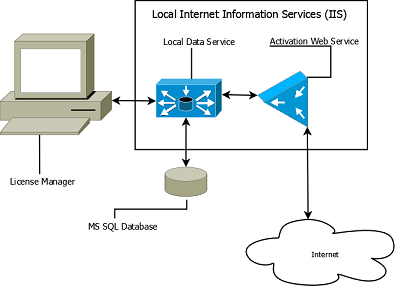 This operation can be performed manually using License Manager or automatically using Activation Web Service. Online Activation Key validation. You can configure your application to connect with Activation Web Service to check if the licensing information (license file or Unlock Key) and Activation Key are still valid and stop execution if they aren’t. So if you remove Activation Key or information about purchase from the database your application will not work (in case of money back, for example). Create licensing information (including license files and unlock keys) in automated mode. 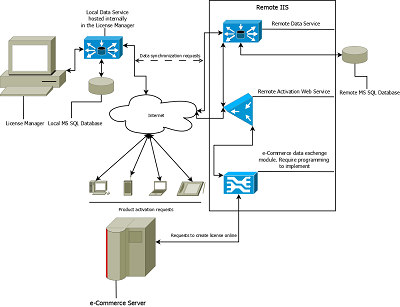 Activation Web Service can communicate with e-Commerce systems (like RegNow and ShareIt!) and create licensing information on demand by request from those systems. All necessary information about client and sale can be filled in at this time as well.